The following incidents were reported to the Cambridge and/or MIT Police between Oct. 11 and Oct. 18. This summary does not include incidents such as suspicious activity, false alarms, general service calls, medical shuttles, or isolated incidents of theft. Oct. 14: E60 30 Memorial Dr., Attempted breaking and entering. Oct. 14: 77 Massachusetts Ave., Witness reports a woman was assaulted by male. Oct. 16: Baker House (362 Memorial Dr.) Wallet and cell phone stolen. 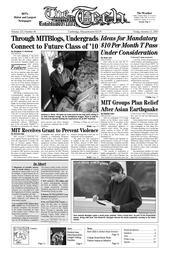 Compiled by Marjan Rafat and Tai DaCosta with assistance from other members of the MIT Crime Club.